It is the Eve of Cybils Shortlist announcements! Every year I've done something a little different for a Cybils statistics post. My first year, 2009 (Easy Readers/Early Chapters), I posted a list of all my reviews and what I was doing with the review copies. In 2010, (Fiction Picture Books) I reviewed every single title and had only energy enough for a quick commentary on the shortlists of various categories by the end. In 2011 (Nonfiction Picture Books), I posted a more complex shortlist commentary, but I also broke down all the nonfiction nominations by subject, type of illustration, etc. In 2012 I was on the Graphic panel and also took over Nonfiction Picture Books as category chair. I posted a list of all the Cybils titles I purchased for my library as well as a break-down of the graphic nominations by genre. I also posted a reflection on collaboration and the benefits of Cybils (in addition to reading lots of great books!). This year I have a running list of every Cybils nomination I've reviewed, but I also returned to my first love, Easy Readers/Early Chapters and continued as chair of the newly reorganized Elementary/Middle Grade Nonfiction categories. SO MUCH DATA. I've mostly looked at titles libraries would have on their shelves, so the data doesn't include several self-published or very small press items. My library is in a consortium of 42 libraries, with access to a huge range of libraries across the state, in case you're wondering if I had a truly representative sample. 30 titles (estimate) were entries in a series. 2 titles from the same series were nominated from 3 series. Other: Adults, anthropomorphic adult animals, inanimate objects, etc. I'm generally skeptical about biographies for very young children - I don't think they have the context to really be interested in historical figures, which is why, in my opinion, picture book biographies really only work in schools, where teachers can introduce them in the context of classroom units. However, this easy reader biography of Anne Frank really, really works and I was surprised and pleased to see how good it was. The story talks briefly about how Anne was an ordinary little girl, who liked to play with her friends, write, and collect pictures of movie stars. It explains the Nazi invasion in simple terms and shows their persecution of Jews without being too graphic or frightening. Most of the story focuses on Anne's life in hiding and how, despite the difficulty and sadness of her life, she still maintained hope, as symbolized by the chestnut tree. The story ends by explaining that although Anne did not survive the war, she lives on in her words and in the hope and kindness she believed in. This is a level 3 Step Into Reading title, intended for 1st through 3rd grade. The language still has the brief, declarative sentences of an easy reader, but more complex vocabulary (collected, thoughts, opinions, memories, complained, etc.) is included as well as the more complex context of the story itself. The art is soft and pastel, conveying the fear and sadness of the story without making it nightmarish. The dark, earth-colored art doesn't do as well in the final illustrations, showing Anne's legacy and the hope she left behind though. Verdict: I would definitely recommend this for a public library. It's a great introduction to Anne Frank for young children, as well as being a good story for them to read, even without complete context. Parents (and teachers) will want to be prepared to offer more explanations of the historical events, including Anne's death, since kids will probably be curious to find out more about her life. This was a short week. My aide is not here and my second aide doesn't start until January, so I did a fair amount of shelving (although not as much as our awesome circulation staff, who rallied valiantly to the cause). Mostly it was a bits and pieces kind of week - we're closed the 24th and 25th. I spent a lot of time working on end of year reports and statistics, fiddling with minor things, cleaning off my desk, and rummaging through Pinterest to see if I could actually USE some of those ideas I've been collecting. If you're the kind of person who likes data, you can look forward to three very lengthy posts on budgets, programming, and circulation data coming up in January! Weeded the Ws in the picture books and the Christmas books. Phew! And, of course, zombie books. We delete them, a few months later THEY RISE FROM THE DEAD! Some of the holiday books seem especially prone to this. Books about kids in other countries, especially picture books, are hard sells at my library. My picture book audience is all young children and many of these books are aimed at a grade school level. 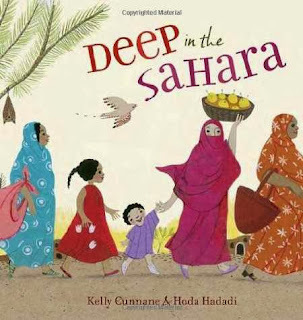 Since I'm looking for picture books that make good storytime read-alouds for younger children, it's hard to find something that genuinely portrays the children in a foreign culture but doesn't make it so foreign that the kids in my small town can't relate to it. I think this book manages to hit all my exacting requirements. Lalla wants, more than anything else, a beautiful malafa. She wants one for beauty like her mother, for mystery like her sister, to be a lady like her cousin, to be like a long-ago queen like her grandmother. Finally, in the quiet of the evening, Lalla wants a malafa so she can pray like her mother. In her beautiful new malafa, Lalla knows that a malafa is all the things she thought it was and more; it's for faith. A note from the author explains how she came to change her views on women's veils after spending a year in Mauritania. There is also a glossary for pronunciation. Although American culture has very few rites of passage for children anymore (think about how many small girls don't need to borrow their mother's high heels anymore - they have their own) I think small children will definitely get the idea of wanting to play dress-up or borrow the pretty things their mother or older sisters wear. The unfamiliar words are clearly defined in the context of the text. There are brief references to the Koran and Muslim faith, which may bother parents who are uncomfortable with introducing their young children to a different religion (The closest Mosque to our town is at least 30 minutes away and we have maybe 3 Muslim families, so this is something kids are unlikely to be familiar with) but the religious references are very general and I think parents can easy cover it all under faith and prayer if they're not ready for a discussion of comparative religious beliefs. The art is what really sells this for me. The malafas glow with color and pattern and swirl enchantingly around the warm and comforting extended family. In some ways this isn't just about wanting to grow up, religious beliefs or cultures; it's about the strength and relationships of the women in Lalla's family. The settings include lots of tiny details to intrigue children from bats in the trees to the houses like "tall cake". Verdict: This is a lovely way to gently introduce young children to a different culture as well as a celebration of growing up. The art and story is accessible and this is a good selection even for a small, homogeneous community like my own. I have mixed feelings about Catalanotto's work. Some of his picture books have fans, like Question Boy, and I do like Ivan the Terrier (although the eyes are a bit freaky) and my library has lots of fans of his concept books, Daisy 123 and Matthew ABC. 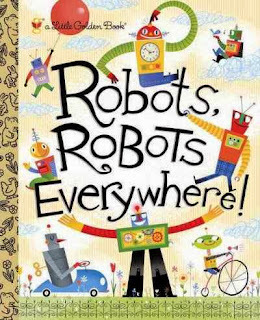 And not every author and illustrator can hit it right with each title. However, I think he really missed the boat on this easy reader and I am a bit flabbergasted that it got published by a mainstream publisher, and is even going to become a series. Look at the monkey. Look at the monkey's face. Look at the monkey's mouth. Look at the monkey's TEETH. I'll wait while that image settles into your brain. The four chapters are fairly typical easy reader/odd couple fare, although they do have a bit of added nonsense. 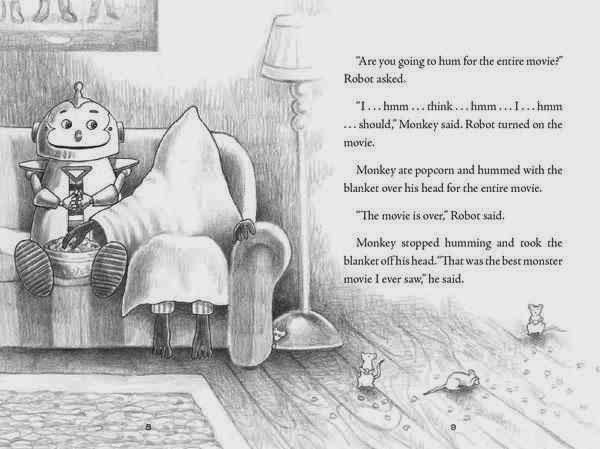 The two friends watch a monster movie together, although Monkey is scared and keeps his head covered for the whole movie, thus leading to what is arguably the best illustration in the book because you cannot see the monkey's face. In the second chapter, the two friends are going to try playing a "nice, friendly, fun game." which is hard for Monkey who doesn't like to lose. There's a little confusion over the dice (Monkey thinks Robot is telling him to die) and then a dog steals the die! Fortunately, they figure out a way to play anyways. The third chapter shows Robot explaining to Monkey about the cocoon he has found, but there are some unexpected results. This was probably the funniest chapter. In the final chapter, they're playing hide-and-seek. Robot explains how it works to Monkey (Monkey is...oddly ignorant of things like cocoons and traditional childhood games. Maybe he spends a lot of time with his head under a sheet.) but the game doesn't turn out to be as fun as Monkey expected. Fortunately, all ends happily. As I said, the stories are ok, sometimes funny, a bit odd in places, but overall not too bad. The art is what really turned me off though. I know Catalanotto is a decent artist, because I've seen his work in other books, but these black and white drawings looked like something a kid drew in school with a pencil and a working knowledge of perspective. 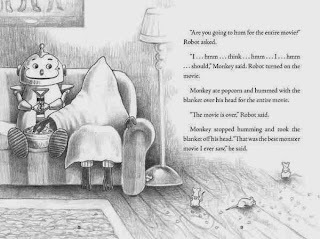 Monkey is so badly drawn, even in the scenes where his teeth aren't freakily glaring at the reader, that I found it impossible to concentrate on the text. I went to my vendor and looked at demand for this title to see if it really was as weird as I thought, or it was just me. This title was published in January and from June 2012 to October 2013 total demand was 1717. To put this in perspective, A Pet Named Sneaker by Joan Heilbroner (which I'd consider a filler easy reader) was also published in January and had a demand of 2893. Dig, Scoop, Ka-Boom by Joan Holub (which I'd think of as a hot topic/popular easy reader) was published in June and has a total demand from January to October of 2065. It was a Junior Library Guild selection, but frankly I haven't been very impressed with JLG's easy selections in the past (I use them for YA titles). Verdict: There are some good points to the stories and I liked the humor at a couple points, but overall I felt this title was poorly illustrated and has less than stellar writing. Not recommended. I sometimes think the "making stuff" books are the hardest section to do collection development for. It seems like there's no lack of excellent nonfiction on a variety of subjects, but try to find a book of crafts or recipes that is easy enough for kids to tackle, complex enough not to bore them, interesting enough for adults to be involved, has good directions, attractive layout and photographs, but not too easily outdated, diversity in the models and activities, and is unique enough to be worth purchasing but not so weird that nobody will ever pick it up...phew! This is a pretty good cookbook. It's not ideal, and my personal preference is still for the DK books, even though they often have confusing British terms, but it's definitely worth purchasing. Most of my patrons and their kids want books on baking, but I try to add in some general cookbooks from time to time. ChopChop is apparently a magazine, although I've never heard of it (which wouldn't be surprising, as I don't read magazines). The layout of the book is quite magaziney though, with lots of photographs, bold and large text, and the title is only available in paperback. It starts with a simple introduction to kids on why it's fun to cook and not to be scared to try new things. Then there's a series of general tips, like being willing to try new tastes, and more specific things like remembering to clean up. There's instructions on how to wash your hands. The next section is an introduction for parents. It acknowledges the extra mess kids in the kitchen can make, but encourages parents to let kids try anyways! There's a list of essential ingredients - I don't agree with their thoughts on kosher salt, but they do say you can use any kind of salt. The photograph shows organic yoghurt, 365 (Whole Foods brand) oil, King Arthur flour, white tuna, dijon mustard, and organic chicken broth. The essential equipment list is pretty reasonable - knives, bowls, measuring tools, etc. and there's a second "not essential" list that includes a blender, salad spinner, and food processor. The first "recipe" is actually a "seasoning experiment." It shows the kids how to cook plain potatoes and try out different kinds of seasoning to see what they like. This was a pretty good idea and one I haven't seen before. The recipes in the book are divided into Breakfast, Lunch, Dinner, and Desserts. Breakfast starts a section on things that don't need to be cooked, then has smoothies, oatmeal and granola, pancakes, french toast, eggs, and breakfast sandwiches. Lunch stars with a section on sandwiches, including quesadillas, then has some more egg dishes, and tuna and chicken salads as well as a recipe for trying your own mayonnaise. The rest is a wide variety of dips and spreads ranging from hummus to guacamole and peanut butter. Then they have "lunch bowls" which are things like "pasta or grain bowl" sort of salads. In between lunch and dinner they have a section on soups and the introduction emphasizes how easy it is to change soups to match your own tastes. I, personally, feel I have eaten enough beans to last me a lifetime and refuse to eat any soups containing beans. Except maybe lentils which aren't really beans in my opinion. There's also a section on breads in the soup section - cornbread, multigrain rolls, and buttermilk biscuits. After the soup section is a salad section, which is actually a salad dressing section since that's what all the recipes are. The actual salad "recipe" is lists of ideas of things you can put in salad. The last section on dinner once again encourages kids to try new things and experiment with "family dinners" using candles, having conversation, etc. Again, it may not be to my personal taste (I remember family meals where we were supposed to "talk about our day" with great distaste and much preferred being in my room with a good book, but again that's just me and most parents will probably applaud the ideas presented here. Just...if you have introvert kids or sulky teens, do you really need to have conversations about what they would change about the world or if they could have dinner with one person, living or dead, who would it be? My choice would be dead because they wouldn't talk to me while I was trying to read.) Ok, a little off topic here. Anyways. There are a lot of basic chicken recipes, then a selection of burgers (including a bean burger). There are tofu recipes and then customizable meals like chili, baked potatoes, and tacos. There's a section on pasta (and I'm sorry, but there is no point in eating whole wheat pasta when "you will learn to appreciate its flavorful, grainy goodness." It starts out tasting like cardboard and keeps on that way. Again, just my opinion.) which includes lasagna and then finally some vegetable recipes, mostly different things you can roast. I did notice with appreciation that they include artichokes which makes me wonder if they didn't have some California influence somewhere - only people I ever met who regularly eat artichokes were from California. The dessert section is probably the weakest part of the book, but I wouldn't be buying this for that part so it doesn't really matter. It starts off rather patronizingly saying that "Of course, we think a piece of fruit is itself a lovely and satisfying dessert - but we understand you might feel otherwise." The first dessert is baked apples, not bad, then applesauce (since when is that a dessert?) fruit crisp, frozen yogurt, and fruit tart. Then they have brownies. Now, I can't speak from personal experience but having done quite a bit of baking with whole wheat flour, I am highly skeptical of their statement that brownies made with whole-wheat flour makes them "nutty, rich, and amazingly yummy." Banana bread, yes, cupcakes, yes, chocolate chip cookies, yes. Oh wait, chocolate chip cookies with whole wheat or whole wheat graham flour. Here I can speak from personal experience. Cookies made with whole wheat flour are disgusting. They taste like sugar-infused cardboard. They make great weapons, being as hard and heavy as a brick, but not great desserts. Molasses cookies might be ok with whole wheat flour, and their peanut butter cookies have no flour. Fruit and nut energy bars are not a dessert. The final section is drinks and has lots of things kids will enjoy mixing like fruit, honey, mint, etc. The book ends with acknowledgements, an index, and a brief note about ChopChop magazine and the author. Verdict: There's a really great diversity of recipes (and kids used in the pictures) and they're laid out in a way that's easy to follow, with some things marked "expert" and most being projects kids could easily handle with a little adult help. There are a couple slightly patronizing areas and I think they should have either left out the desserts section or relabeled it fruit and just skipped the baking part but I think people will be able to mostly overlook that. 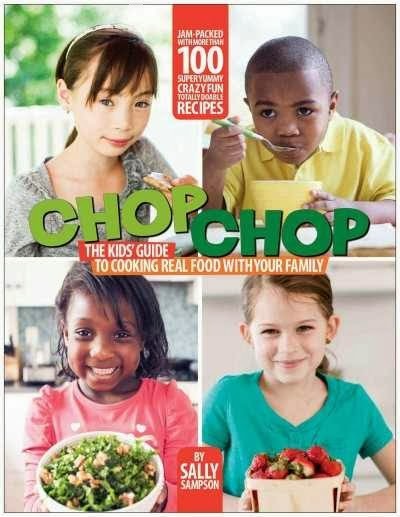 It's not the book I'd hand to kids and parents who have no experience cooking or are just starting trying to eat more healthily; the emphasis in the photographs on expensive, brand-name or organic food and again several patronizing areas could be very daunting, but for families who are serious about kids being involved in cooking and family meals and who already have done some research about their food choices, this is a good selection. These are all the Cybils nominations I've read and reviewed as of today. Note that some links will lead to my reviews at No Flying No Tights and some to my Flying Off My Bookshelf short reaction pieces. *Starred items were purchased for or added to the library through review copies etc. I took off Monday and Tuesday to do fun things then I had my last outreach visits on Wednesday and Thursday, sort-of interviews for the aide position (it seems silly to have a whole sit-down interview for a six-hour a week shelver. Basically we just wanted to meet them.) and miscellanous stuff. Then I worked Saturday. Crazy! I quite liked the first Joe and Sparky easy reader I read, but the years came between us and when I saw that another saga in the Joe and Sparky adventures had been nominated I wasn't quite so enthusiastic off the bat. Would it live up to my memories? Had Joe and Sparky lost any of their fizz? Well, I am a bit more of a critical reviewer now, but Joe and Sparky still have most of their pizzaz. In the classic easy reader odd couple style, Joe is a giraffe who's always curious and eager for new situations. Sparky is a turtle who just wants to sit in the sun and relax. But no matter what crazy trouble Joe gets them into, they are still friends and they make it through together. In this story, Joe sees something big, yellow, and loud. What could it be? "Well," said Joe, "from the looks of it, it is a bus for noisy short people." One little accident later, and somehow Joe and Sparky are on their way to school. Fortunately (or unfortunately from Sparky's point of view) Miss Hootie breaks her glasses, so she doesn't realize she has two new students - who have decided to take a field trip to school. But school isn't as fun as they'd hoped. Joe tries and tries but he just can't get a star, while Sparky is soon covered in stars - but just wants to go home. 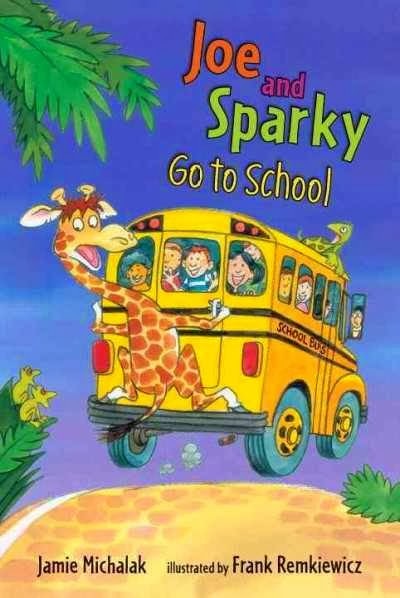 They try the math dance, math food, the interesting "pond" in the boys' room (since there's no giraffe or turtle room) more and more things go wrong for Joe, but Sparky is learning something new - he loves school! With a little help from Sparky, Joe gets a star after all and they both head home after their fun field trip. The illustrations are bright and really pop with Joe's bright yellows (Sparky thinks he looks like a bus!) and splashes of green and blue. The "class" is mostly shown as the same four or five kids, with a fairly decent show of diversity. The real focus is on Joe and Sparky of course, and their antics and misunderstandings. These are a bit like Amelia Bedelia, but not quite so over the top. The difficulty level of these easy readers is intermediate. There are complete sentences and paragraphs and some challenging vocabulary, as well as the word play. Verdict: These are great intermediate easy readers. Funny, with humor that will reach kids on their own level, attractive art that adds to the text, and while each story follows a similar pattern, the plot is different enough to keep kids' interest going. Recommended. Bink and Gollie have the best of both worlds, with a classic style and a contemporary flair. 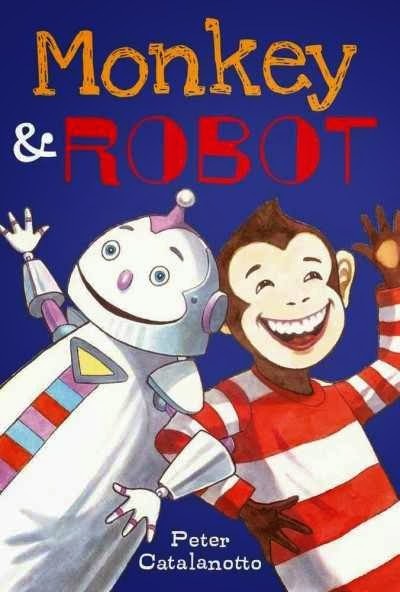 In the classic tradition of easy reader odd couples, Bink and Gollie are total opposites, both physically and in personality, but they're best friends nonetheless. There are three chapters, each containing a separate story. In the first story, Gollie is thrilled to discover she's really royalty. When short and spunky Bink comes over to hear the exciting news, she's disappointed that Gollie is no longer going to cook pancakes for her and leaves. At first, Gollie enjoys being a queen, but eventually she misses Bink and is happy to go back to being plain old Gollie again. In the second story, Bink is tired of being short and tries out a marvelous invention to grow taller. It doesn't quite work the way she had hoped, but with some help from Gollie she feels taller in the end, even if she hasn't grown at all. In the third and final story, Bink and Gollie decide to start a collection, hoping to get their names and picture in a book of records. With a little help from another friend, they find a way to make a record even if they don't have an amazing collection. Fucile's facile illustrations use an economy of line to express emotions, humor, and action. 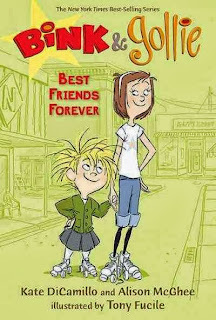 Bink and Gollie are splashes of bright color in a gray and white world, their backgrounds fading behind them as they skate through the story. In addition to being an odd couple, Bink and Gollie returns to another older style in not fitting perfectly into any of the tightly boxed publishing categories. Are they an easy reader? Well, they're a little oversized, but they have the odd couple, three short chapters, brief text, and spot illustrations. But the text is much more advanced than the typical easy reader. Are they a beginning chapter book? They're way oversized for that genre, and while the vocabulary level matches a chapter book, the limited text and colored illustrations are more in line with an easy reader. Some libraries just give up the fight and put them in graphic novel, or even picture book. I recently moved them from easy reader to the general juvenile fiction area to fully honor what I think is the most classic part of their style - stepping out of the bounds of typical publishing levels and creating a story that's both sweet and tart and utterly unique. The emphasis in Bink and Gollie is on the fun of the story, the suspension of disbelief, the delightful illustrations and not on what reading level or comprehension is appropriate for whoever is lucky enough to light upon the adventures of Bink and Gollie. Verdict: Wherever you decide to put these stories, they are a delight with a sly sense of humor and a topping of silly. For the right child, these are the stories that will stick with them until they go searching for them again to introduce them to their own child. I've always been a fan of sea lions, not seals. Seals look like slugs, big furry-whiskered slugs. At least, that's what I always thought until I read this book. This book falls into one of my favorite new styles for read-aloud nonfiction, double text (I just named it that). There's a basic story in big, bold letters and simple text. In this case, it starts with the seal dragging himself across the sand and into the sea to look for food, takes him through a long search, escaping from predators, and finally back to the beach where he relaxes. The second part of the book's text is in small, inset paragraphs and adds facts about gray seals from how they swim to how they can open their mouths underwater to catch fish without drowning. The book starts with a brief note about wild seals and ends with a simple index (which would make a great introduction to indices for very young children) and a couple websites kids can go to for more information about seals. The endpapers show the eighteen different kinds of true seals, draw on a cream-colored background in shades of brown. The illustrations in the book look like adapted photographs. The seal's huge, liquid black eyes and sharp details of his whiskers and some of his surroundings are shown, but they're softened and given an underwater look with swirls and a shifting overlay of colors. Verdict: When I'd finished this book I knew a lot more about seals and they were a lot more interesting! Although they could never live up to sea lions, I'll definitely take a longer look next time I'm at the zoo. 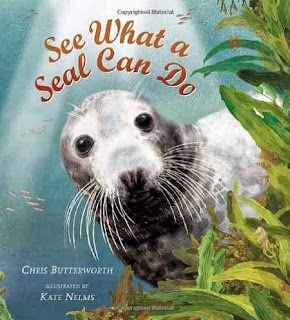 This would make a perfect storytime book, as well as a great introduction to both seals and nonfiction for young children. Highly recommended. This week at the library; or, Last week of programs! It has been a week of highs and lows. Some things I can't talk about - administrative stuff like wages and salaries are keeping our lives interesting. We always replace the last Toddlers 'n' Books of the season with a cookie program and a LOT of people came. 50? 60? Something like that. Of course, it was this morning that Hammie chose to go to that great hamster wheel in the sky, but fortunately I didn't check him until everyone was gone. Right now Hammie is visiting Santa and next week he's going to return (having gone on a diet and dyed his fur a little darker) with a brother, Humphrey, who will hopefully distract from any changes! A few more kids returned challenges for Paws to Read and I am hopeful that we will make my overall goal of 50 participants for this first year. HA HA HA that's just what people think I do when there are no programs. I'm going to be planning winter programs, scheduling and organizing outreach, overhauling Preschool Interactive, working on reader's advisory and other resources, lots of marketing and publicity, end of year reports, hiring and training a second aide, and doing a lot of shelving while my first aide is gone over the holidays. I'll also be working on my newest idea (I know, hard to keep track!) Maker Kits! More on that later! 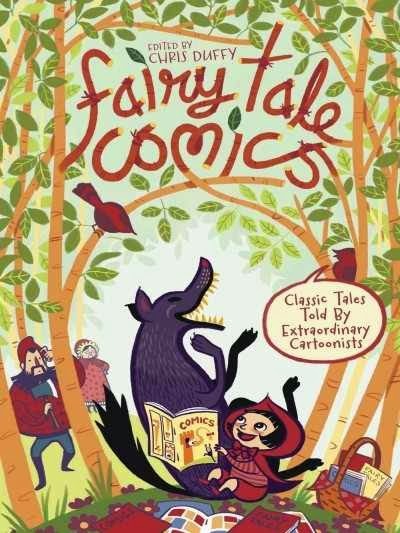 A companion to Nursery Rhyme Comics, this follows the same format with a different artist interpreting each different classic fairy tale. I was skeptical about the appeal of Nursery Rhyme Comics, since anthologies and short stories of any kind are a hard sell at my library, but it did surprisingly well, circulating 16 times since I purchased it in February of 2012. I decided to give this one a closer look and see if it would have the same appeal. Sweet Porridge by Bobby London (Brothers Grimm) will be familiar to those who know tales with magical mills or other implements that produce food until told the magic stopping words. In this story, of course, the bowl produces porridge. The art has a classic newspaper strip look, not surprising since the illustrator drew Popeye strips for many years. It's a light and funny story that younger kids will enjoy. The 12 Dancing Princesses by Emily Carroll (Brothers Grimm) has a classic, fairy tale look. The panels have strong swathes of color and while it's not my favorite art, being a bit distorted in parts, it's mostly very attractive. It's pretty much a straight retelling of the story, not trying to get around the more icky parts of this story (some adaptations say the princesses were enchanted, but this one pretty much sticks to the original - the girls like to go dancing and don't really care that men are being beheaded for trying to find out their secret). It's a bit wordy and there's not much new to the story. Hansel and Gretel by Gilbert Hernandez (Brothers Grimm) The art is one-dimensional with strong lines and bland colors and the humor is a bit warped. Kids will love it. Puss in Boots by Vanessa Davis (Charles Perrault) I really don't care for Vanessa Davis' art style (her other book is a memoir, Make me a woman) but I have to admit the appeal of this story. The art is very distorted and kind of ugly, but it's undeniably funny, from the cat trying on his boots from the "itty-bitty bootery" to the princess and kind taking the air in the back of a pickup truck. Little Red Riding Hood by Gigi D.G. (Brothers Grimm) Very digital art and nothing really added to the story except the woodcutter is a heavily-muscled woman. Didn't care for this one, I don't think kids will either. The Prince and the Tortoise by Ramona Fradon, Chris Duffy, James Campbell and Jack Morelli (1001 Nights) This story will probably be new to most kids, but seeing the prince marrying a tortoise will tickle their funnybone. The art has a classic comic book look, think Prince Valiant. There's lots of humor and odd bits in this story and it was interesting to read - it's been a long time since I read 1001 Nights. The boy who drew cats by Luke Pearson (Japanese, retold by Lafcadio Hearn) This is the same person who wrote the Hildafolk books, which I adore, so of course I will love this. It's very, very funny in a laidback way. I think kids will find the cats drawn all over everything hilarious and I especially loved the final droll joke. Rumpelstiltskin by Brett Helquist (Brothers Grimm) I don't really think of Helquist as a graphic novelist, but he does a good job with a sort of distressed oil painting look, which ages his usual rich oil style. Now, I'm not going to say I'm biased (although I'm still mad about the awful covers he did for my beloved Green Knowe books) but I didn't really see the appeal of this story. It's just the same fairy tale with illustrations, it doesn't even address why the miller's girl is apparently perfectly happy to marry the horrible king who was willing to kill her (and looks about 20 years older than her). Rabbit will not help by Joseph Lambert (Bre'r Rabbit) This story didn't really work for me. I'm familiar with the Bre'r Rabbit story, but it's a particularly confused one and Lambert's button-eyed creatures, many of them sporting creepy overbites, didn't help. I'm not sure kids will like this or not. The random violence and events might be kind of interesting, but the animals are sort of freaky-looking and the story doesn't really move smoothly. Rapunzel by Raina Telgemeier (Brothers Grimm) It's Raina Telgemeier, everyone will love it. I loved that Rapunzel saved the day and her final innocent remark to the wicked witch made me choke with laughter. I'm not sure kids will get the joke, but they'll love the art and movement. Telgemeier is huge here, so anything she's done will be devoured. The Small Tooth by Charise Mericle Harper (English tale) When Harper is good, she's good. When she's not she's WEIRD as heck (see Henry's Heart). This one doesn't quite fall on the weird side of the line, and I do have a lot of Fashion Kitty fans, so it will probably be quite popular. It's nice to see some of the old English tales as well. Goldilocks and the three bears by Graham Annable (English tale) Apparently this author does something called the Grickle cartoons and comics? They sound vaguely familiar, but I can't quite place them. This is a pretty straight-forward retelling, but the pictures are funny. Baba Yaga by Jillian Tamaki (Russian tale) I love Baba Yaga tales and this artist really caught my attention. Lovely art, well-suited to the story and she did a good job of picking a harmonious run of elements. I really look forward to seeing more work from her. Bremen Town by Karl Kerschl (Brothers Grimm) I didn't like this art at all, sort of glowy watercolors and why does one robber have a blue face? I don't know if kids would like this one or not, but I didn't care for it. I thought he took the fun parts of the story out too. Give me the shudders by Mazzucchelli (Brothers Grimm) I was so glad they included this story, it's one of my favorites! Basically, the youngest son (it's one of those third youngest fool stories) can't get the shivers and spends three nights in a haunted castle. I didn't care for the way they changed the ending, but it was ok I guess. The art is different but fun. Azzolino's Story Without End by Craig Thompson (King and His Storyteller by Petrus Alphonsi) This made a nice ending for the collection, even if it's a bit obscure and possibly overly clever as well. Verdict: Will kids like this as much as Nursery Rhyme Comics? Well, I didn't think they'd like that at all and they did. I see this collection as much more appealing, so possibly that means it won't be at all! Regardless, it's a great introduction to lots of different comic artists and styles, and would make a great book to help kids find their next favorite graphic novelist, although it's a little annoying that many of the artists usually only do adult things. Overall, I'd buy it and intend to do so. Sea Monster Ernest is eager to show the new fish around school. But the new fish isn't nervous, like Ernest was when he first came. In fact, the new fish is a little...make that a LOT...bossy. He gets more and more controlling, until he starts the Fresh Fish Club for cool fish and Ernest, while happy to be included, is worried about the fish who are left out. Ernest comes up with a non-confrontational, if a little sappy, solution and everyone is happy again, even the new bossy fish. 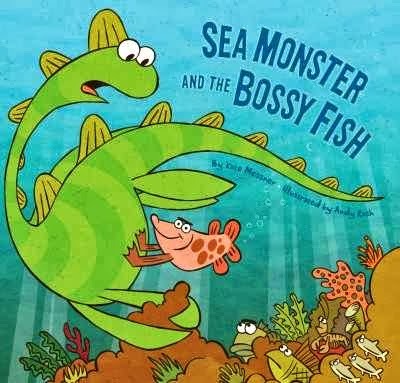 Andy Rash's cartoons are bright and colorful, with silly fish faces and lots of clever artwork fitting the giant sea monster in with the other fish. The fish have big, bulbous eyes and a plethora of patterns and shapes. With their very human expressions matched to fishy bodies, kids and adults will get a kick out of the child-pleasing art. I have to admit I was skeptical when I first picked this book up. I'm not a fan of bibliotherapy and I dislike the whole bullying theme in books for younger kids. Parents do ask for them - I had a patron request picture books on bullying because she said there were a lot of bullies at her child's preschool - but I'm personally not a fan of labeling bully behavior in such young children. A three year old, in my opinion, isn't a bully - they're a three year old! Not to mention so many of these books fall into the "big stupid bully" cliche or the "bully who really just wants to be friends" cliche. However, I should have expected an excellent author like Kate Messner to steer clear of these pitfalls and this is one book I'd feel happy handing to parents whose kids are having social difficulties in school. 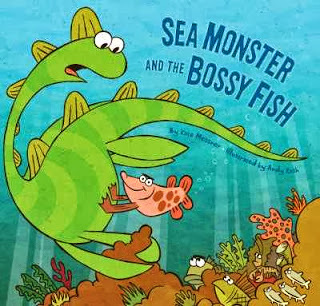 Her fishy kids are very realistic, from Ernest who's easily swayed by the exciting new kid, even if he has doubts, to the bossy new kid himself. I especially appreciated that she didn't label the kids and showed the subtle social interactions that went on without making on of the kids out to be the bad guy - just not understanding how to play nicely. While the solution is a little mature for the kids to come up with on their own, and a little sappy, it fit in well with the book. 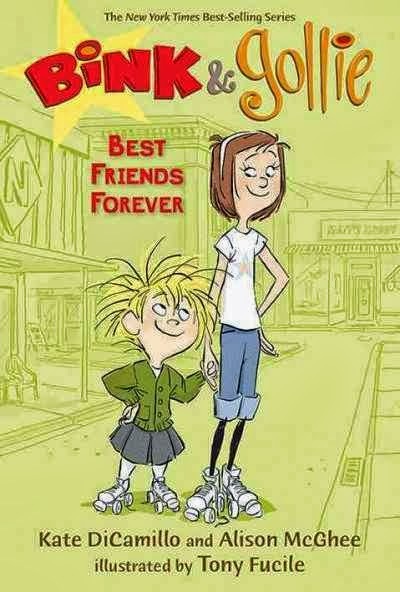 Verdict: If you have parents clamoring for anti-bully books, and you probably do since that's one of the "hot topic" issues right now, this is a really good choice for younger kids, with a funny story, a gentle lesson, and no black and white labeling. I saw this series, Eye on the Wild, at an ALA conference a few years back and fell in love. This one is my particular favorite, because I love bears. Beaaaars, so round and furry and awesome. Beaaaars. Ahem. So, this is a picture book format, simple introduction to the life cycle, especially the growing-up years, of a brown bear. The story of the bear's lives begins with their birth in the den and moves through their growing up years until they set out on their own. The text is simple and bold, using plain language to explain to young children how the bears' mother takes care of them and adding in interesting facts seamlessly to the text. It's a little longer for reading aloud to very young children, but four year olds up through first grade will enjoy listening to this. Of course, the big draw of these books, and this one especially is the bears. Eszterhas is a wildlife photographer and specializes in photographing families and baby animals, so you know there are going to be lots of awesome bear pictures. I loved the way it started out showing the bears when they were small and they slowly grow through the story, following the text, so at the end they're as big as the mother bear. Close-ups show the cubs nursing, fishing, digging for clams, and more. A final page gives a list of bear facts and there are more photographs on the endpapers. I would have liked to see some sources or bibliography, but this is an introduction for very young children so it's really not necessary. 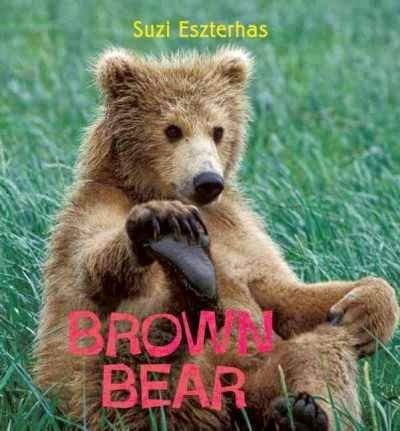 Verdict: Adorable photographs and simple, clear text perfect for older storytimes or bear fans. There are also volumes on the cheetah, gorilla, lion, orangutan, and sea otter, which is my other favorite. There was supposed to be an elephant and tiger next year, but they appear to be cancelled on Baker & Taylor, although they show available for preorder on the author's website. Hopefully that will change, since these are great books to introduce young children to popular and endangered animals. This is as much a discussion as a review, so sit yourselves down and get ready to lambast me in the comments. Before we start - this is just my opinion and what works in my library. Just because you do something different, it does not mean you are a Bad Librarian (or me either for that matter). So, the two books I have here today are Little Golden Books. 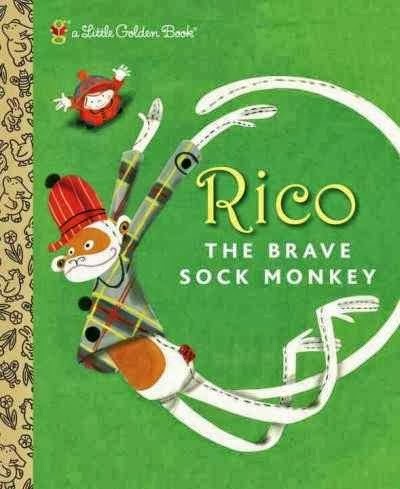 Rico the Brave Sock Monkey is a classic mash-up of Corduroy and Toy Story, complete with vintage illustrations. Robots, Robots, Everywhere has a Seussish vibe along with Staake's bold designs. They're both cute and fun stories, with lovely illustrations and strong content. But how many libraries add Little Golden Books to their collections? I'm betting more in our area, since we are near Racine, original home of the Little Golden Books, but not many. They're not a good format for library collections, being skinny small and having no spine information. And this leads us to another discussion, and my main one today. I've been thinking about this for a while as I read blog posts and listen to librarians about being commercial-free, making children's areas that don't have branded toys, and collection development. Do you buy Barbie books, Thomas the Tank Engine books, or tv tie-ins, many of which are Little Golden Books? Do you have them and plan to weed them, especially after some of the posts about commercial and brand-free library collections? I agree with these ideas in theory and have implemented some of them. Most of my toys and circulating toys are brand-less and encourage dramatic and interactive play without a pre-written story to stick in the kids' heads. I think this is important. Collection development though is a different matter and here I'm going to get, possibly, a little controversial. Do I, personally, think kids should be reading tv tie-ins, Barbie books, etc.? Frankly, no. I didn't watch tv at all as a child and movies very rarely. I wasn't allowed to play with Barbies (and wasn't much into dolls anyways). I hate the commercialization of childhood and I enjoy a good diatribe on Disney Princesses as much as any other dedicated peruser of Hearthsong. But, and this is a big BUT, do I have the right and the authority to make that decision for my parents and kids at the library? If I have a mom and her daughter come ask me for Barbie books, should I say "you shouldn't be reading those they will commercialize your child, are badly written, and do not encourage early literacy"? However tactfully you put it, in my opinion, this is a kind of snobbish, reverse censorship. Yes, I try to have a balanced collection, I try to buy the best books that have both child appeal and literary quality (woo Cybils! ), I try to educate people on the benefits of reading together, of books that promote early literacy skills, of limiting screen time, but I am also a public librarian. I'm here to provide what my community wants and needs - not what I think they SHOULD want and need. What impact have the tub books had? Most of the tub books circulate anywhere from 15 to 30 times each every year, which has definitely had a positive impact on our circulation. Positive reactions from patrons - now when they ask "do you have Dora books, Barbie books, etc." I can say "yes" and the patrons know that the library has what they want, that I listened to their requests and they feel ownership in the library. Parents who used to text on their phones while their kids hung out in the play area now sit down and read together. The play area also has all the board books and until a few months ago had the concept books as well, but the "real" picture books were not circulating well there. Many of these parents, as I can tell when I listen to them read, are not strong readers. I think the "real" books were daunting to them. But a familiar character, that both they and the child know, feels safe and easier to approach. Reader's advisory - I've used the Tub Books as jumping off points, both approaching patrons and being approached. I've introduced Barbie and Disney Princess fans to Fancy Nancy and Ella Bella Ballerina, Disney/Pixar and Thomas fans to the nonfiction trucks and machines section, etc. Most people check out a mixture of Tub Books and "real books", so it's increased circulation in other areas as well. It's not all sunshine and flowers - Tub Books can be messy, since kids frequently pull the tubs off to rummage through them, the books often look tattered and generally icky, and they have a tendency to fall into cracks and behind things. I made the decision that I'd rather have an ephemeral collection that was frequently updated than expensive prebound copies that would last past their interest date and I spend probably an hour at least every couple of weeks taping up rips and stapling the books back together. I also had to work with the circulation staff to know that Tub Books were going to look like crap and not to send them back to repair. Ultimately, this has been a positive thing for our library and if you think it's something that would positively impact your community and that fits into the mission of your library, I encourage you to think about the needs and wants of your patrons and give it a try. This is a mess, but you can kind of see how it works. Those are book bundles up on top. I am planning to make signs to put on the shelves with pictures so the kids can match up the tubs themselves, if they're not reading yet. Monday was a definite Monday-After-A-Holiday. In a word, it sucked. Tuesday was AWESOME. I felt like singing that song from Annie "yesterday was plain awful, you can say that again, yesterday was plain awful, but that's not now, that's then" (yes, I had that in my head). I listened to a great webinar about the annual report and realized I could be counting a lot more things! I am going to have phenomenal numbers next year! It was gloriously foggy all day (I love fog) and I felt no guilt for the kindergarteners being insanely wiggly b/c, as I had told the teachers when they asked if I could switch to two weeks earlier at the last minute, it was pot-luck storytime. Then other stuff happened. I spent a lot of time finishing fiddly little things and had some long, heart-felt communions with the laminator. The result being all new signage in our children's area! As you can see, I put new signs on all the tubs and baskets and matching signs on the shelves, so kids can easily put things away. Certain People were skeptical about whether this will work or not, but I have faith in my families! Together, Elliot and Leslie discover the Creature Department, the most mysterious and inventive section of DENKI-3000. But all is not well; the company is in trouble, the creatures who staff the department are threatened, and there's something terrible hiding in the park. This is a wild romp featuring fantastical creatures, gross-out humor, wacky inventions, and some old-fashioned villains. The final version will have additional illustrations and multimedia aspects which I didn't see (I read this as an egalley). At 326 pages the book felt too long for its intended audience to me. Of course, I can't tell from my egalley how much of that will be taken up by the multimedia aspects, but it's still quite a chunk of book. I would say it's directed at a younger middle grade audience with the cartoonish creatures, gross-out humor, and several digressions into didactic discussions of how the inventions are fueled by the essence of hope, etc. and those kids are generally less likely to pick up something really thick. Elliot and Leslie are one-dimensional and the plot skips wildly around, throwing in new characters and creatures and ending with the actual hero being a creature everyone discounted and teased. 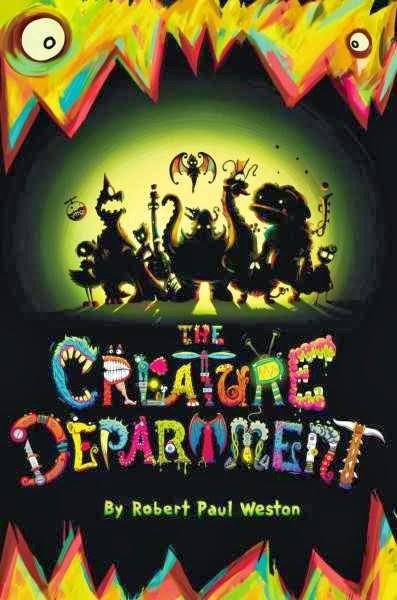 Verdict: Older kids looking for fantasy where they can get immersed in the plot and characters will be disappointed, but hand this one to those kids who are camped out in your 398 section perusing the guides to monsters and dragons and other books with lots of fun pictures and creature trivia and they'll love it. Not a top pick perhaps, but definitely an additional purchase that will find a happy home in most mid-sized to large libraries.